1. Section-A is compulsory consisting of TEN questions carrying two marks each. 2. Section-B contains FIVE questions carrying FIVE marks each and student has to attempt any four questions. (a) What is Maxwell’s reciprocal theorem? (b) What is determinate structure? How do we check the determinacy of a structure? (c) When several point loads are moving on a beam, what is the condition for maximum bending moment? (e) What will be the effect of change in temperature in a suspension cable? (f) What difference between two hinged and three hinged arch? (g) What is middle third rule? Describe in brief. (h) What is limit of eccentricity for no tension criteria in the section? (i) Describe in brief the unit load method of analysis. (j) What is the difference between method of joints and method of section? Q.6. A live load of 20KN/m, 6 m long moves on a simply supported girder of 10 m span. Find the maximum bending moment hat can occur at a section 4 m from the left end. Q.7. 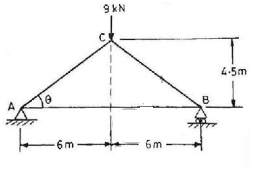 A girder AB of length of 30 m is simply supported at C and D which are 5 and 20 respectively from A. Draw the influence lines for B.M and S.F for the midpoint when the girder is crossed by a uniformly distributed load ‘w’ kN per meter which can occupy the whole or any part of the span. Q.8. A two hinged parabolic arch of span L and rise h carries a concentrated load W at he crown. Determine the expression for horizontal thrust developed at springing. Q.9. A suspension bridge cable hangs between two points A and B separated horizontally by 120 m and with B 20M above A. the lowest point in the cable is 4 m below A. The cable supports a stiffening girder weighing 0.3 KN/m run which is hinged vertically below A,B and the lowest point of the cable .Calculate the maximum tension which occurs in cable when a 10 Kn load crosses the girder from A to B.